I have been proud of the Oban music scene recently. Okay, so my wee town's contributions to contemporary music have not been plentiful - hell, I'd wager that I have personally played in bands with about 75% of the songwriters that attend the open mic night every week. With next to no framework or resources however, a small community of people that appreciate and promote local hip hop has sprung up in the past year. A handful of younger MC's with talent have started setting up Soundclouds, attending these open mic nights and generally giving it a go. I'd particularly shout out young Alasdair Aitken a.k.a. Imprintz 95 as someone to watch out for in the near future because he can really flow. This surge has largely been spearheaded by old-school head K9 Kev, a former accomplice of Chad the Lad and, for the past decade, literally the only rapper in the west highlands that I can actually think of. Just to give you an indication, long before I even knew Kev, their track 'Live For the Weekend' was doing the rounds in my school around 2007. Around about the same time, I was playing in punk bands with Rory 'O'B' O' Byrne, who first introduced me to Sage Francis and the like. A few years later, we were bemused to learn that O'B had taken up rapping himself. So to cut short the fecking history lesson, O'B progressed ridiculously quickly, dropping some promising demos and collaborating with K9 frequently. He's progressed so quickly in fact, he's already called this debut EP “not that good” and just “stuff he made a year ago.” Personal biases aside, I would surmise that this EP is a mere hint of what's to come from O'B, much like Ciaran Mac's debut that I reviewed this week. This track, as well as 'Crash Helmet', also showcase a talent in moulding beats. Though he admits his mixing is not yet quite up to scratch (no pun intended), he has a talent for using samples that help enhance the mood of a track. In both these cases in fact, they serve as the actual hook. The lyrics here are harder to decipher, partly because his motorised flow means he's often reciting his stuff at breakneck speed. If anything, the only real weakness is that he sometimes tries to do too much at once, racing through concepts without brevity. O'B was blatantly keen to get this release out of the way, partly because the production as a whole does not sequence appropriately for a defined project. The tracks themselves though are nicely executed, so consequently, this feels like a compilation of O'B testing the waters. The song 'Home' even demonstrates his penchant for an acoustic/celtic style, utilising local songwriter Dave Ayling for the backing. 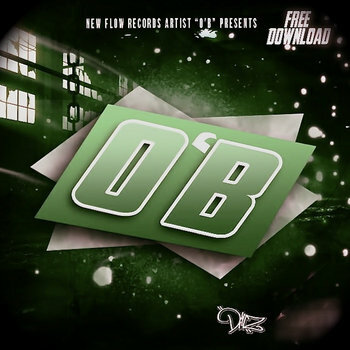 Though this gives the EP a disjointed feel it is very much typical of O'B's ambition to make hip hop that is uniquely “Scottish”. In that sense, even if he tries to do too many things at once, this debut project is a success. If you want to hear properly crafted hip hop from a genuine storyteller, O'B is one to watch over the next year.